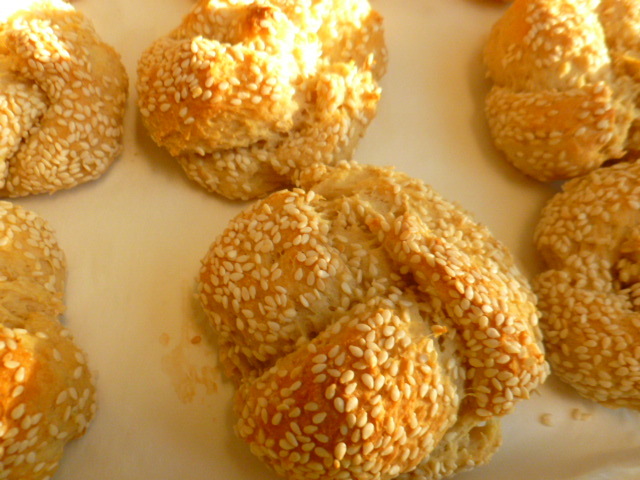 These tasty rolls started with some yogurt that was close to expiration date. 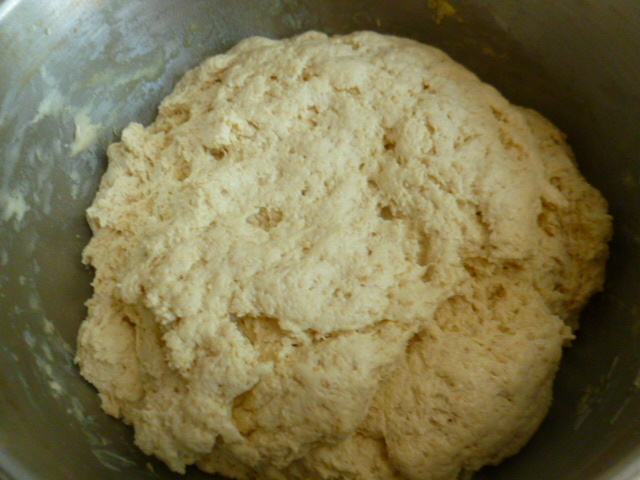 I decided to use it in the form of a yeast dough, which I enriched with oats, semolina and olive oil. 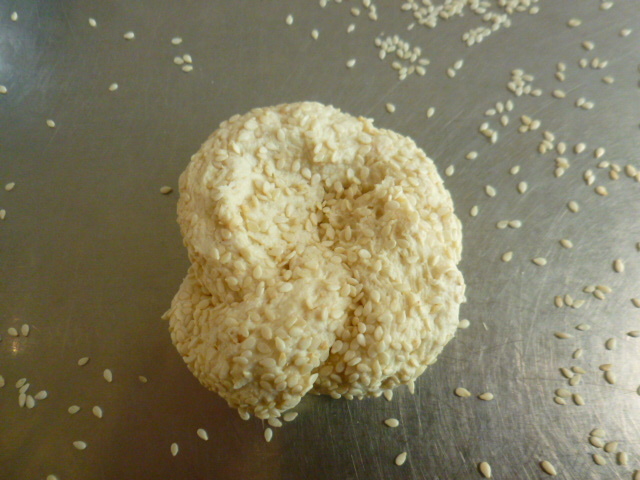 To make it even more nutritious and interesting, I decided to roll the dough in sesame seeds. The seeds added another layer of texture and a nice nutty flavor. 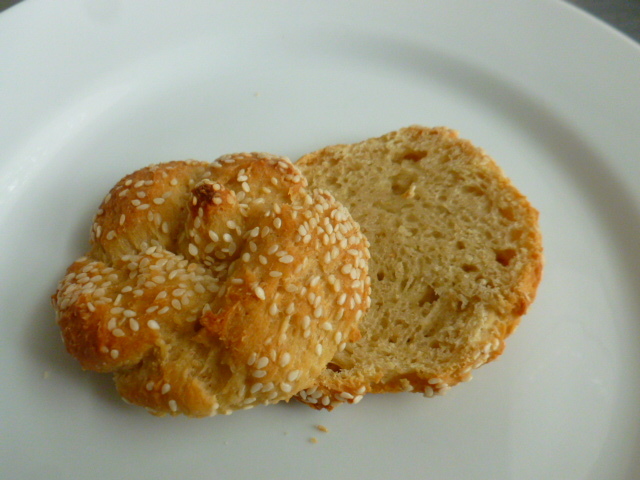 Unlike white flour, oats and semolina don’t have much gluten in them. As a result, the rolls are fairly dense and chewy in texture, making them ideal for serving for breakfast or brunch. They are great warm out of the oven, or cut in half and lightly toasted. Try them and enjoy. 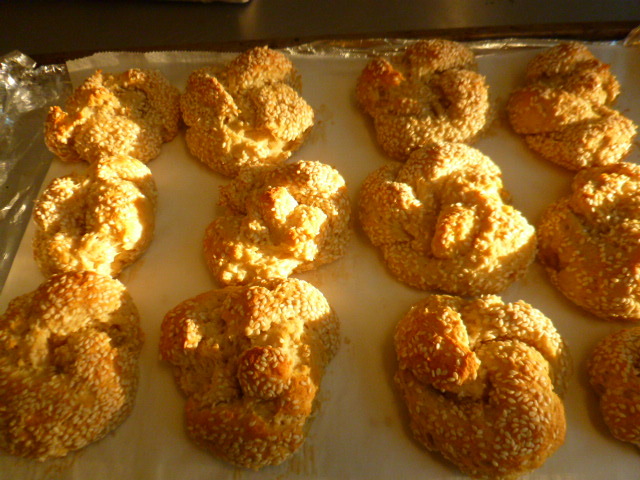 * Poppy seeds, or other seasonings, can be used instead of the sesame seeds. 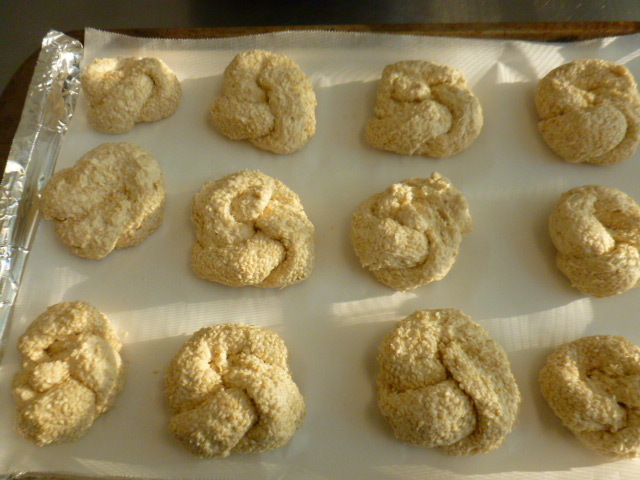 * The rolls freeze well, in an airtight freezer bag, for up to a month. For best results, bring them to room temperature and reheat in a toaster oven, not the microwave. 1. 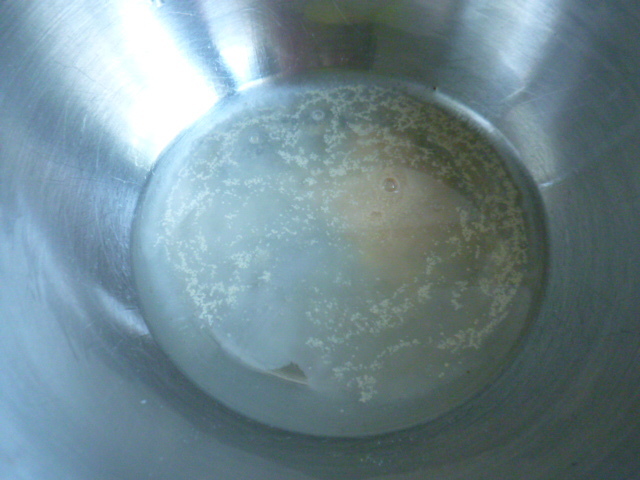 In a large bowl, mix the water, yeast and sugar. 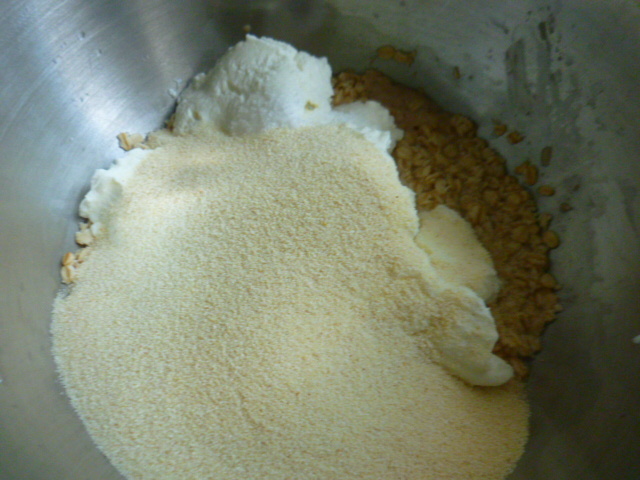 Cover and keep in a warm place for 5 minutes, until the mixture foams. 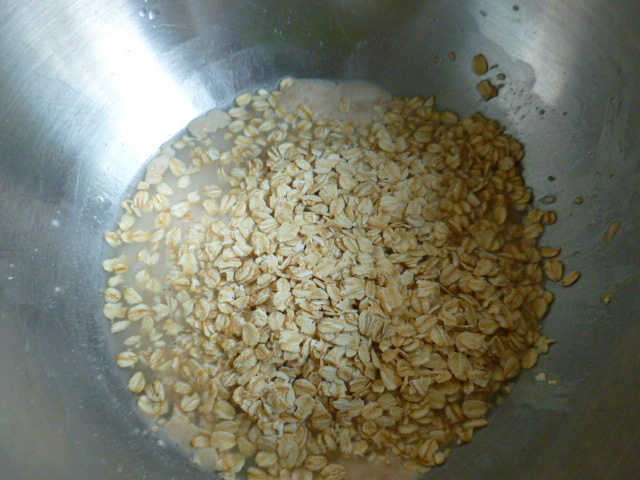 Add the oats and keep for 5 minutes longer, to soften them. 2. Add the yogurt, semolina, flour and salt. 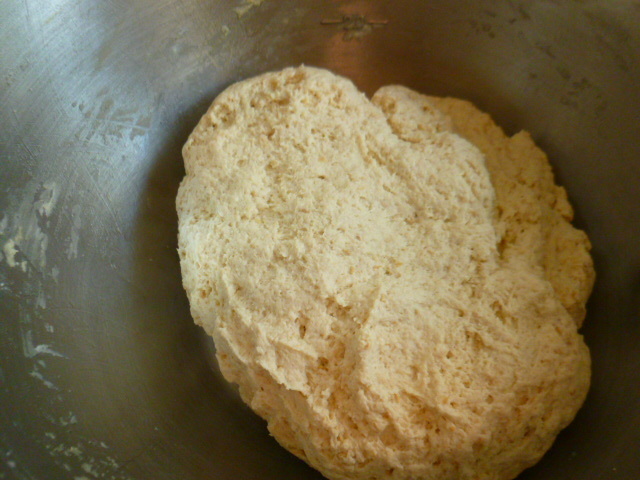 Knead for a few minutes, until the dough is smooth and separates from the sides of the bowl. 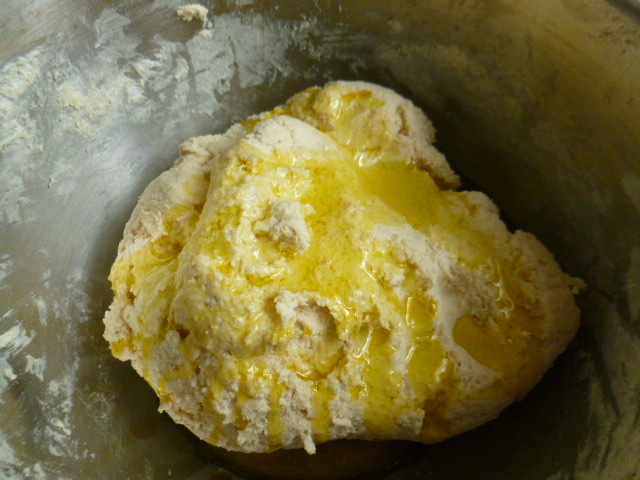 Pour the oil over and roll the dough in it. 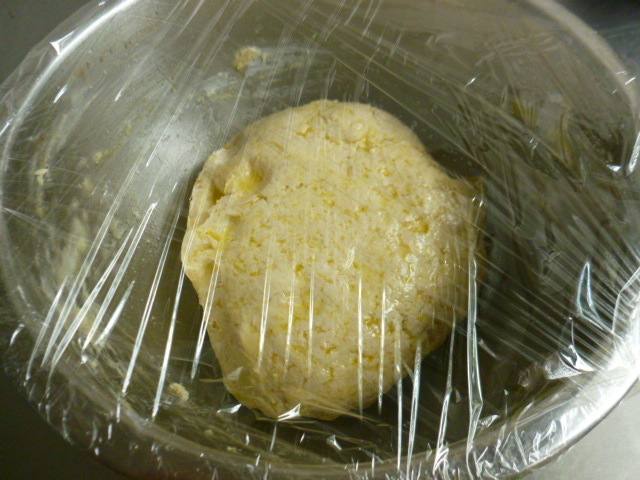 Cover with plastic wrap and keep in a warm place for about 3 hours, until the dough doubles in size. 3. 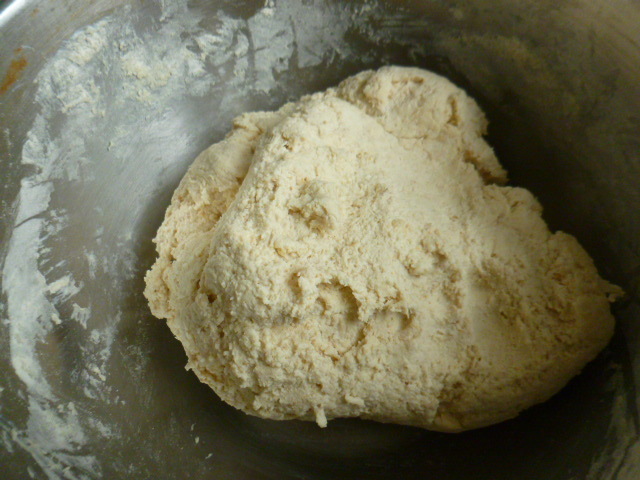 Punch down the dough and knead for 3-4 minutes. Divide into 18 portions. 4. 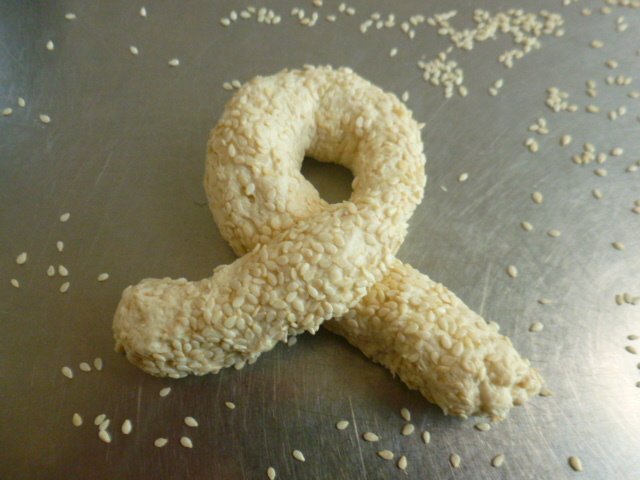 Sprinkle the work surface with sesame seeds. 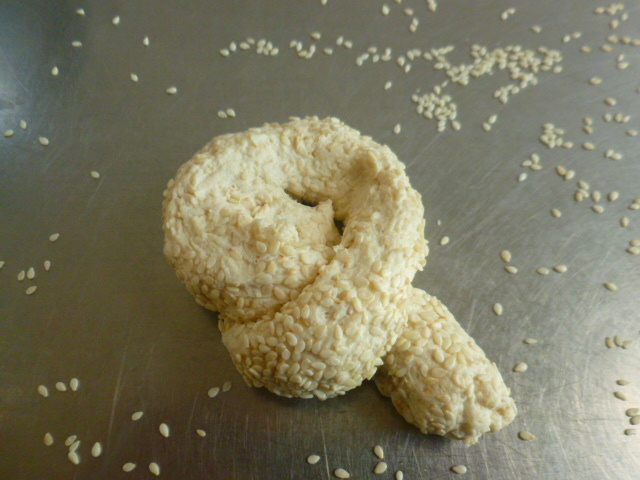 Roll each dough portion over the sesame sees, into about 9” (23cm) log. Fold as shown in the photos, or to any form you prefer. Place on the baking sheets, leaving space between the rolls. Cover loosely with baking paper and keep in a warm place for 30 minutes. 5. Preheat the oven to 375F(190C). Line two baking sheets with baking paper. 6. Bake for about 30 minutes, until the rolls are golden-brown. Serve warm. Those are beautiful and yummy looking! Those would be great as sandwich rolls. I think I might sprinkle in some potato flakes and an egg to lighten them a little. The ones I’ve been making are great for home, but not quite sturdy enough for a car-seat picnic! I’ll use my five-grain rolled cereal in place of the oats. The idea was to create a denser/chewy type of rolls, so I don’t really see the point in adding either eggs or potato flakes to the dough. I would want to try for just a slightly lighter, yet still chewy roll. The ones I have been making with flour, an egg, and potato flakes are just a little too fluffy, but this slightly different ingredients list might turn out to be perfect for that particular purpose. I like this recipe a lot! 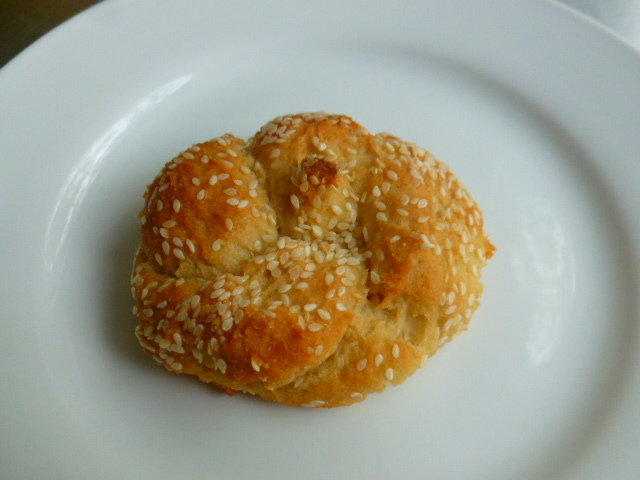 I’m always looking for new ideas for rolls or bullar as we call them here. Semolina is such a fun flour to work with and your recipe looks so good. I have a question, is the semolina you use coarse or fine. What we normally have here is fine like the tipo 0 is. Thank you Ron, I’m glad you liked the recipe. I enjoyed creating this dough and hope you will too. Thanks, It looks like tipo 1 and no problem finding it. Such a unique recipe. I love using yogurt for making bread. I’m not sure my rolls will be as pretty as yours but I think I shall give this a go. 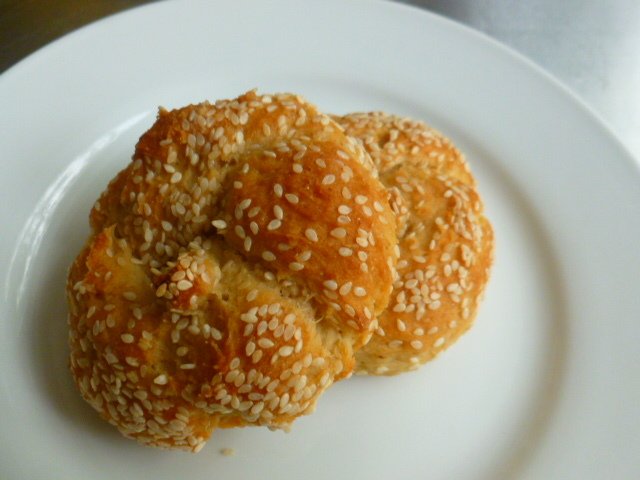 Love the sesame in these rolls and it’s crafted so well! I’m sure they tasted great! 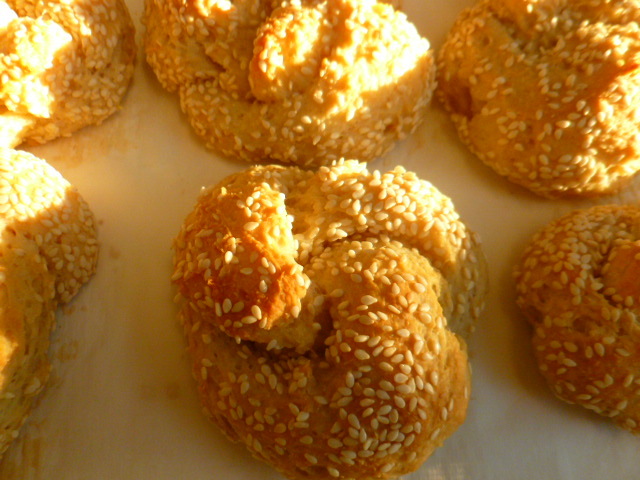 Wow Ronit – I love the balance if ingredients in the rolls – especially the oats and also the yoghurt, one to try for sure!